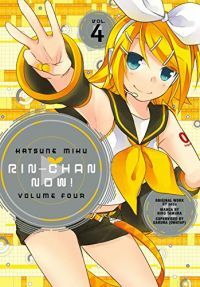 The happy days hanging out with Kagamine Rin and her fellow Vocaloid Hatsune Miku continue, as Rin-chan takes a literary turn...causing confusion in a bookstore and insisting on meeting the author of her favorite fanzine! Based on the video with over 2.5 million combined views on NicoNico and YouTube, the Rin-Chan Now! manga is written, drawn and edited by the video creators!